Looking for an all natural mattress that’s latex free? It can be harder than you’d think. And it can be more expensive than you’d like. 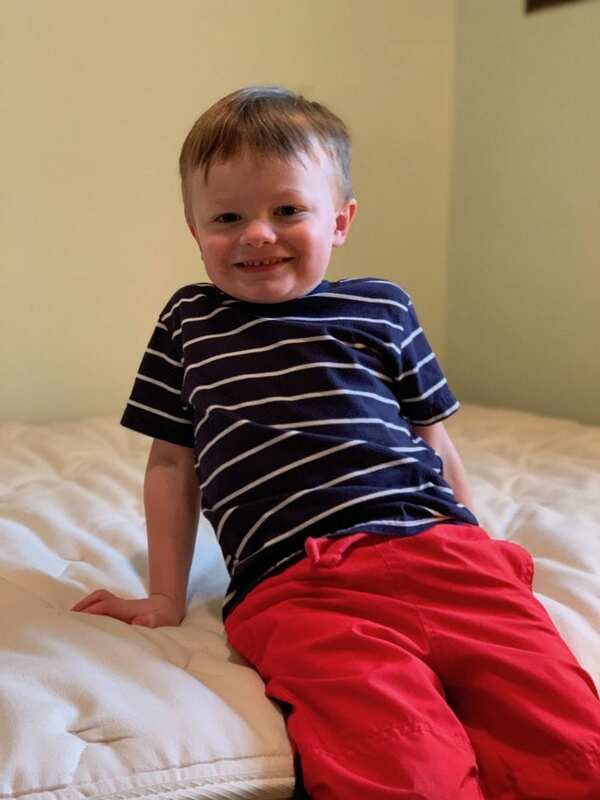 Which is why I’m happy to tell you about Joybed! Joybed Mattress is a relatively new mattress relying on their designer’s decades of previous mattress design. They’ve taken what they like, and didn’t like, about all other conventional mattresses and created an all natural mattress using only cotton, wool and plant based materials. 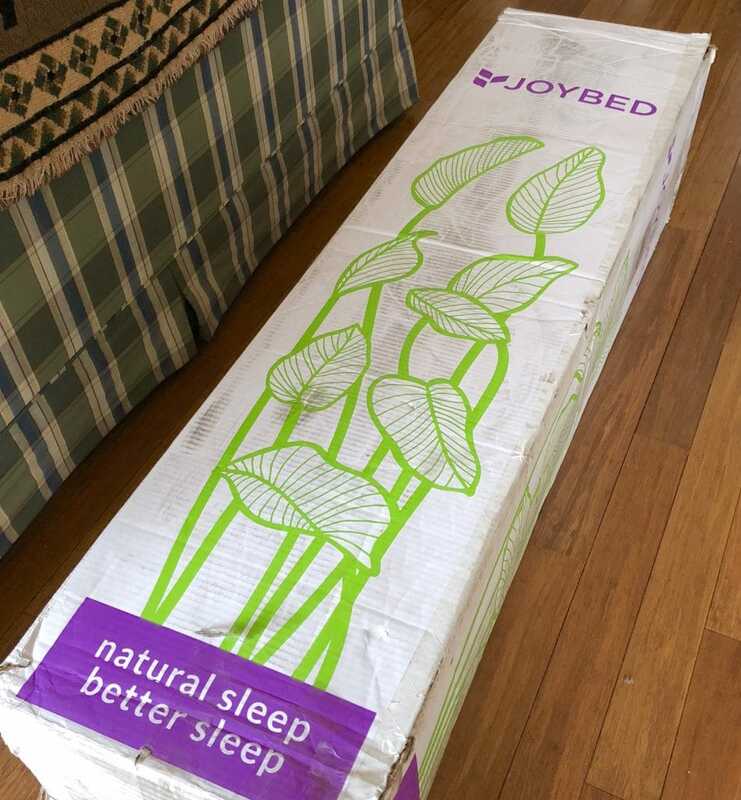 When Joybed asked if I wanted to try their new Joybed mattress, I definitely said yes. Well, I said yes after confirming that the plant based products contained no soy fibers, since I’m allergic to soy. Soon, the natural bed in a box was quickly being shipped and arrived soon after for me to try out. 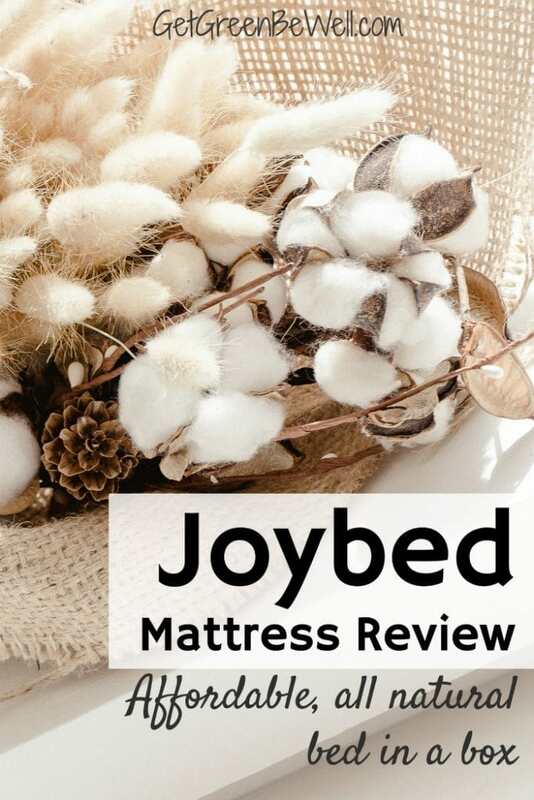 Joybed prides itself on using only all natural materials in their mattress. They are passionate about not using chemicals in their beds. All of the materials are from American suppliers 🙂 Plus, the mattresses are made in the USA in Grand Rapids, Michigan. FYI: Wool is only used in Joybed’s Luxury Firm and Luxury Plush mattress. Joybed’s Medium mattress does not contain wool, and is a vegan mattress. If you don’t know, wool is all kinds of amazing for bedding and mattresses. Because wool is a miracle fiber. It whisks away moisture easily, absorbing up to 30% of its weight in moisture. When it’s cold, wool’s fibers are filled with lots of tiny little air pockets that insulate you naturally. The wool will trap the heat and keep you warm. Wool fibers are also naturally antimicrobial. Joybed’s wool comes from Oregon. The sheep graze on grassy fields and not organic feed, so they are not certified organic. American grown cotton is used in Joybed. Cotton is another natural material that helps you regulate temperature. Cotton can absorb up to 9% of its weight in moisture. The outer cover of the mattress is GOTS Certified Organic cotton. 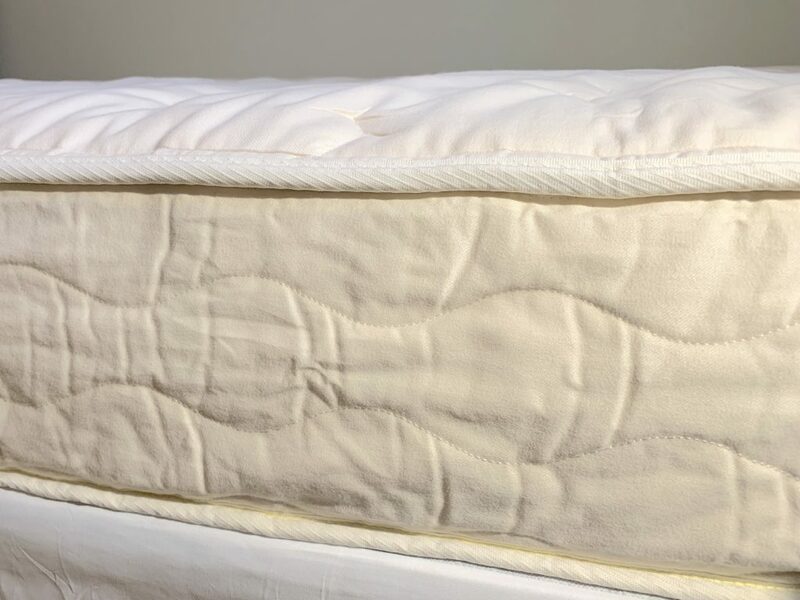 The cotton inside the mattress is not certified organic. Joybed uses a variety of plant fibers to meet federal fire safety certifications without having to spray toxic chemicals for fire retardants. The plant fibers include leaves and stems from farm crops, such as potatoes and beans. It’s an unusual concept if you’re not familiar with it. Yet the fibers do provide softness and fire safety with no chemicals. Joybed has a really strong desire to have a foam free and latex free mattress. Foam in mattresses is often made with an alphabet soup of chemicals. These chemicals are not something that you want to be laying on all night. And they tend to off gas VOCs. Latex can be man made from chemicals or natural from a rubber tree. I have many natural latex beds and mattress toppers and can honestly say that I enjoy them. Although I do agree that they sleep hot. Many natural mattress options today contain latex. Especially bed in a box mattresses because latex can be compressed and fit into a box. It is definitely unusual to find an all natural mattress not using latex that also ships as a bed in a box. Joybed is among the few companies offering that mattress option. I’m like you. There’s no way that I’m going to order a natural mattress online if it doesn’t have a great return policy. You will have 120 nights to try out Joybed. If you don’t like it, they’ll return 100% of your money. 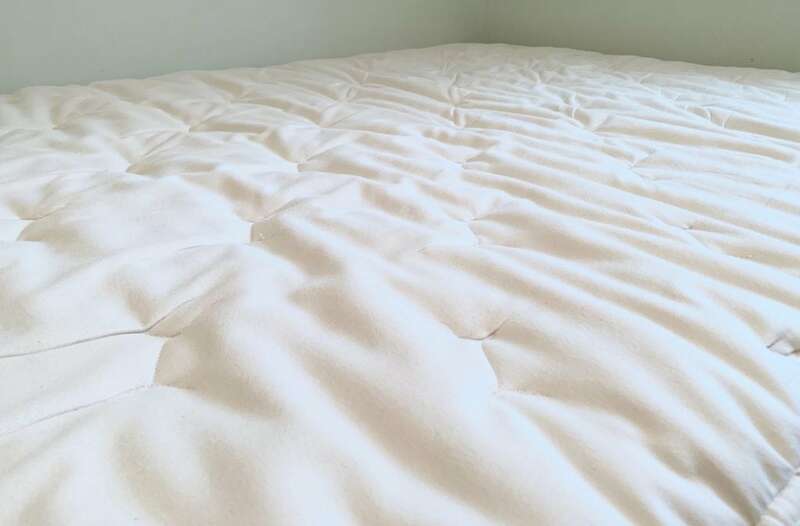 I chose a queen Joybed mattress in Medium Comfort to review. After my Joybed mattress was ordered, I was surprised at how quickly it came! 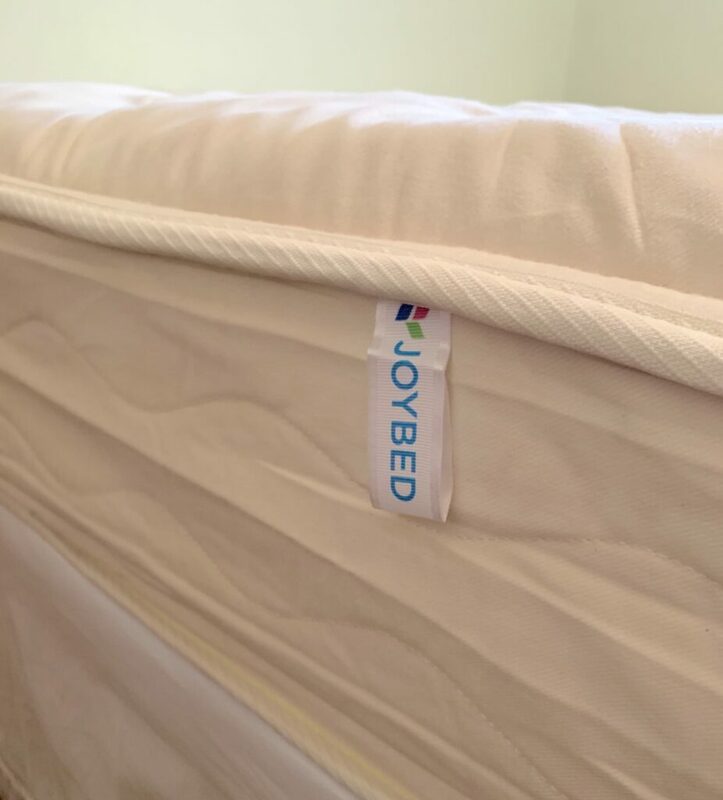 Joybed mattress will arrive in about 3-5 days and includes free shipping and handling. It does come as a bed in a box. After the box was delivered, we unrolled it on a bed frame. The natural material mattress quickly and easily unrolled and decompressed within a minute or so. I’ll admit, I didn’t know what to expect. I’ve tried a variety of all natural mattresses. But I’ve never tried a mattress with plant based fibers as the fire safety. So I was kind of secretly hoping it wasn’t a hard, scratchy bed that smelled weird and wasn’t comfortable. What we discovered is that Joybed is quite comfortable and looks and feels like a traditional mattress! I don’t know why this is so surprising to me, but I think I’m like any other mattress buyer trying to decide what mattress to buy online. 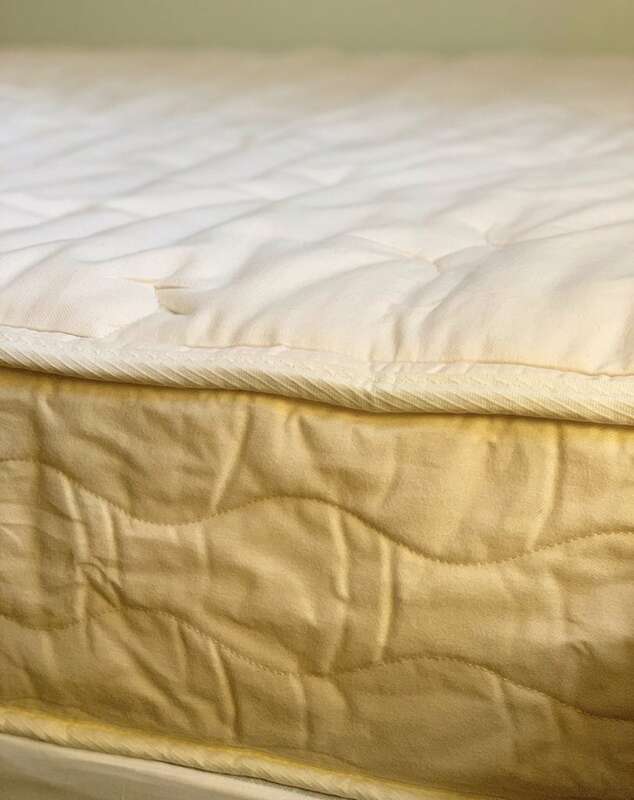 A natural material mattress does not have to resemble a futon just to avoid chemicals, latex or foam. In the modern world, all natural mattresses definitely have the look and feel of traditional mattresses, just using non-toxic materials. 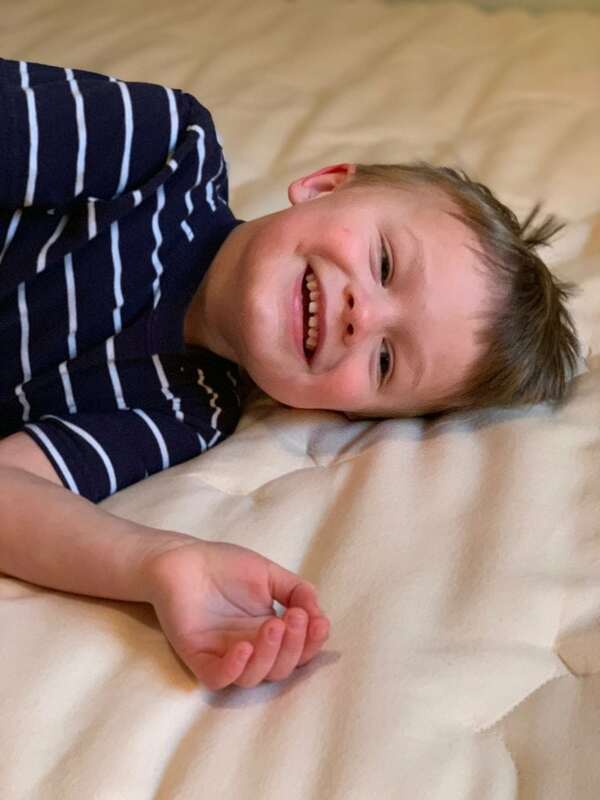 We are happy with the softness and comfort of the Medium Joybed mattress. It does have pocketed innerspring coils, and I like the combination of an innerspring mattress with all natural materials. I did not notice any weird smell with the Joybed mattress. 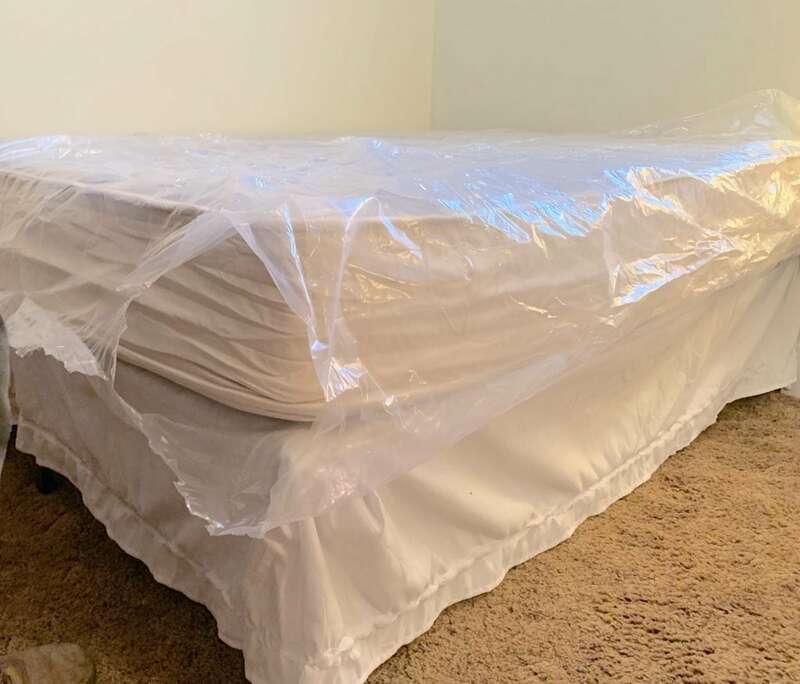 While I know that the all natural materials would not be off gassing chemicals, sometimes natural mattresses can still have an offensive smell. I did not notice an odor. 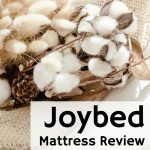 Would I recommend Joybed as a great all natural mattress? Absolutely, YES! I’ve been pretty vocal about how difficult it can be to get a bed in a box mattress delivery when it’s not delivered to your door. We live on a second floor and have found that UPS does not carry the box up the stairs. If you have a bedroom on a second floor inside your home, and cannot lift the very heavy box, you might have problems, as well. 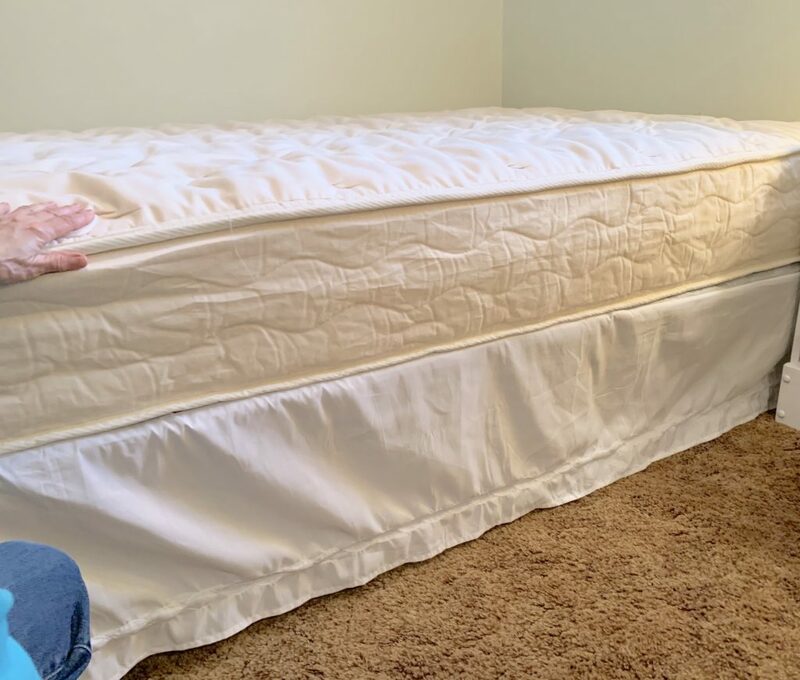 Joybed does offer a delivery service (often known as White Glove delivery) which will arrange for a time to have delivery people deliver the bed and set it up, as well as bring away an old mattress. The service does cost $150 and takes about 1-2 weeks to schedule. However, it could be worth it to you.